(i) Bob is an audit assistant currently undertaking university studies. While auditing the books of Club Casino, he comes across certain financial statement that he believes will assist him in completing one of his university assignments. 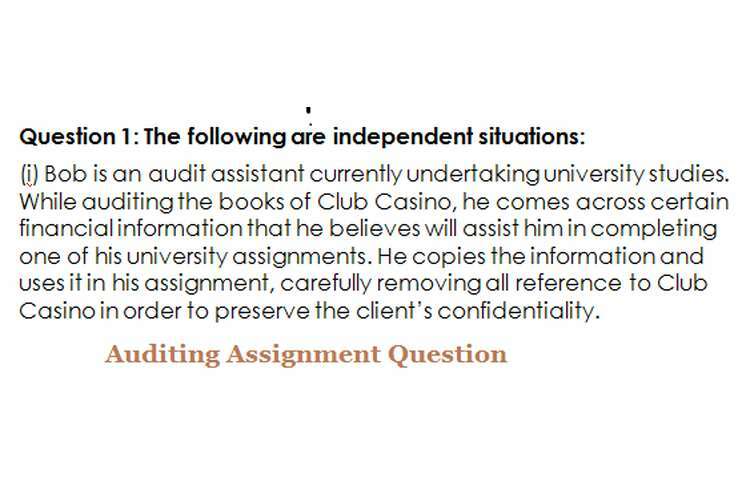 He copies the information and uses it in his assignment, carefully removing all reference to Club Casino in order to preserve the client’s confidentiality. (ii) Wendy has been the engagement partner on the Ace Limited audit for a number of years. Some time ago, Ace’s long-standing company secretary retired and Ace took six months to find a replacement. At Ace’s request, Wendy performed company secretarial duties for this period of time. (iii) Leo is the eldest son of the factory foreman of one of your firm’s major audit clients, Precision Machinery Limited. During vacation work, L is assigned to the audit of Precision Machinery. Leo’s work comprised testing the internal controls of the cash payments system. (iv) Chan & Associates are auditors of Classic Reproductions Pty. Limited, a large furniture wholesaler currently experiencing financial difficulties. Classic Reproductions is a significant client of Chan & Associates and have not paid their audit fee for the past three years. The audit partner recently threatened to resign from the audit if the outstanding fees were not paid. To prevent this occurring, Classic Reproductions offered to supply Chan & Associates with new office furniture. The partner accepted this offer in full consideration of the outstanding fees, even though the furniture was only worth 50% of the balance. As a thankyou present, Classic Reproductions gave the partner a 25% shareholding in an unrelated listed company. At present these shares are worth $1,000. Chan & Associates do not act as auditors of this company. Question 2: Consider the following independent situations, all of which apply to audits of entities for the year ending 31 December 20X7. (i) Slipway Limited, a listed company, has been experiencing declining sales over the last 2 years. Cost cutting has proved difficult due to the high level of imported machinery used in Slipway’s operations and consequently margins have been falling. While the bankers are presently happy to continue providing Slipway with loan facilities, they do expect to see improved results in the next financial report. Articles about Slipway’s expected financial results appearing in recent press reports all had quite a pessimistic tone. (ii) Discount Foods Limited is a large supermarket chain with offices in all capital cities around Australia. Until 30 June 20X7 data processing relating to payroll transactions will be carried out in each capital city by an independent computer service bureau. (iii) Getaway Pty. Limited is a long established firm which has been operating a boutique hotel in the Blue Mountains for over 20 years. During this time, it has adopted a conservative business strategy that has seen it produce adequate, though slightly unimpressive, results. A new CEO has been appointed to run the firm from 1 September 20X7. He has already released his plans for renovating the hotel, despite not officially serving as CEO yet. You have also heard him discuss the implementation of a new marketing strategy to boost occupancy rates. (iv) Angora Pty. Limited is a small primary producer specializing in the production of angora wool. Angora’s recent display at a trade show has seen orders flood in from overseas buyers. The accountant, Michael, has done his best to satisfy the orders as quickly as possible while maintaining the appropriate (foreign currency) accounting records. However, from some of the questions he has been asking you, you suspect he is out of his depth. (v) Kings Pty. Limited has been manufacturing uniforms for the Australian market for the last 40 years. The government’s recent tariff reduction policy has placed Kings in direct competition with cheaper uniforms manufactured overseas. In a bid to retain market share, Kings has been selling part of its school uniform range at less than cost. However, overall profit figures remain buoyant. For each of the above independent situations describe the overall impact on audit risk and identify the specific component(s) of audit risk affected. (a) Susan attended the stocktake on 30 June and observed that the client followed the stocktake instructions. She selected numerous items for test inventory from the clients inventory sheets and all were found to be correct. Cut-off details were noted and subsequently checked and found to be correctly treated. Susan concluded that inventory was fairly stated. (b) Susan selected 20 invoices to test the control that the sales clerk checks that the prices agree with the authorised price list. She found 3 instances where the sales clerk had not signed the “prices checked” box in the invoice. The sales manager explained that the sales clerk always checks the prices but sometimes forgets to sign the box. As the prices on all the invoices agreed with the authorised price list, Susan concluded that the control was operating satisfactorily. (c) As part of her work on subsequent events, Susan noted that there were a large number of returns in July of Product 75L. However, as this product was first sold in June and represented only 1% of sales for the year, Susan concluded that the amount was immaterial and no further work was necessary. (d) Advertising expenses are material, although only 50% of last year’s balance. Susan selected a large sample of entries and agreed them to supporting documents. No errors were found. Susan concluded that advertising expenses was reasonable. (e) As part of the verification work on accounts payable, Susan carried out a search for unrecorded liabilities. She tested a random sample of 20 payments made after 30 June, 20X7 and found 3 instances of cheques that related to services provided in June, which had not been accrued. However, as the total of the 3 cheques was immaterial, she concluded that no adjustment was required for unrecorded liabilities. For each of the five scenarios presented above, indicate whether you believe that sufficient appropriate audit evidence has been obtained to support the conclusions reached. Give reasons for your decision. Question 4:Jack Wood is the engagement partner for the financial report audit of Clayton Ltd for the year ended 31 December, 20X7. The following material events or transactions have come to Wood’s attention before he is scheduled to issue his report on 28 February, 20X8. (a) On 3 January, 20X8, Clayton Ltd received a shipment of raw materials from Bangkok. The materials had been ordered in October 20X7, and shipped FOB shipping point in November 20X7. (b) On 15 January, 20X8, the company settled and paid a personal injury claim of a former employee as the result of an accident that occurred in March 20X0. The company had not previously recorded a liability for the claim. (c) On 25 January, 20X8, the company agreed to purchase for cash the outstanding shares of Monash Electrical Ltd. The acquisition is likely to double the sales volume of Clayton Ltd.
(d) On 1 February, 20X8, a plant owned by Clayton Ltd was damaged by a flood, resulting in an uninsured loss of inventory. For each of the above events or transactions, discuss audit procedures that should have brought the item to the auditor’s attention, and indicate the treatment required in the financial report. Give reasons for your decision. reasonably close to the client’s calculations and support the financial report. which is approximately 20 percent of the recorded amount. (c) An auditor is engaged to audit a client’s financial report after the annual physical inventory count. The accounting records are not sufficiently reliable to enable the auditor to become satisfied as to the year-end inventory balances. (d) A client changes its method of accounting for the cost of inventories from FIFO to weighted average. The auditor concurs with the change although it has a material effect on the financial report and has not been disclosed. financial report, which do not include any adjustments that might result from the outcome of this uncertainty. For each of the above situations you are required to indicate the type of audit opinion you would issue, as well as the reasons for issuing the particular audit opinion. ( a) Identify the factors necessary for a third party to sue an auditor for negligence. (b) What factors must the external auditor be satisfied with if the external auditor is to rely on the work of the internal auditor?